PHILADELPHIA, PA – October 2, 2018 – Janney Montgomery Scott LLC is pleased to announce that four of the firm’s Financial Advisors have been recognized by the Financial Times (FT) in the 2018 list of “401 Top Retirement Advisers.” The Janney advisors named to the list include Murray Carter, Executive Vice President/Wealth Management; Brad Dickens, First Vice President/Private Client Group; Steven Glasgow, Executive Vice President/Private Client Group, and Allan Strange, Executive Vice President/Investments. 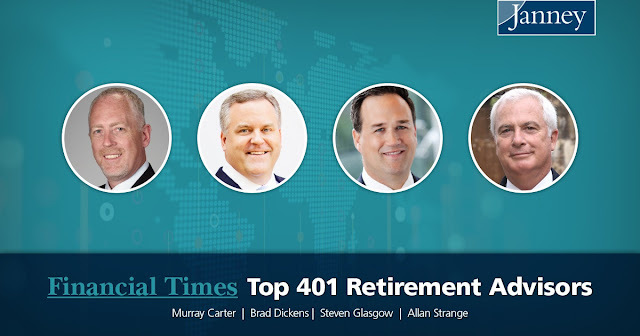 The FT 401 list, now in its fourth year, recognizes the top financial advisors who specialize in serving defined contribution (DC) retirement plans, such as 401(k) and 403(b) plans, across the United States. The final FT 401 represents an impressive cohort of elite advisors: the “average” advisor in this year’s FT 401 has 20 years of experience advising DC plans and advises $1.26 billion in DC plan assets. The FT 401 advisors hail from 38 states and Washington, D.C., and DC plans on average account for 81% of their practices’ total assets. Murray Carter serves as Executive Vice President/Wealth Management and is a founder of CSG Capital Partners of Janney Montgomery Scott. He is one of only four advisors who were recognized by the Financial Times in 2018 as a Top 400 Advisor and Top 401 Retirement Plans Advisor. Mr. Carter has almost three decades of experience in the financial services industry and has achieved the advanced designations of Certified Financial Planner™ (CFP®), Accredited Wealth Management AdvisorSM, Accredited Investment FiduciaryTM, and Certified 401(k) Professional. This is the third time that Mr. Carter has been included in the Financial Times “Top 401 Retirement Advisers” list, with previous recognition in 2017 and 2015. Earlier this year, he was named to Financial Times 2018 “Top 400 Financial Advisers” list. As an industry leader and a member of The National Association of Plan Advisors (NAPA), an affiliate organization of the American Retirement Association that was created by and for retirement plan advisors, Mr. Carter and his team were recognized by NAPA as a Top Defined Contribution (DC) Advisor Team in 2018. Mr. Carter has participated in their DC Fly-In Forum and has lobbied on Capitol Hill, advocating to protect clients’ rights. Brad Dickens joined Janney in July after more than 25 years of experience in the financial services industry and leads MD Wealth Management Group of Janney Montgomery Scott. He is a Certified 401(k) Professional and is one of only ten people in Tennessee with the C(k)P® designation. Along with this prestigious certification, he is also a designated Qualified Plan Financial Consultant (QPFC). This is the first year he has been named to the Financial Times “Top 401 Retirement Advisers” list. Mr. Dickens attended West Virginia University where he earned a Bachelor’s of Science in Marketing and a Bachelor’s of Business Administration in Communication. Steven Glasgow has earned the “Top 401 Retirement Adviser” recognition each year since the program’s inception in 2015. A 27-year industry veteran, Mr. Glasgow has earned the advanced designations of Chartered Financial AnalystTM (CFA®) and Accredited Investment FiduciaryTM (AIF®). This is the fourth consecutive year that he has earned the “Top 401 Retirement Adviser” recognition from the Financial Times, an honor he’s received since the program’s inception in 2015. A nationally recognized leader in the retirement plans space, Mr. Glasgow’s other accolades include being named one of PLANADVISER’s Top 100 Retirement Plan Advisers for 2018 and being recognized as a finalist for PLANSPONSOR’s Retirement Plan Advisor of the Year Award. Mr. Glasgow joined Janney in May and leads the Glasgow Wealth Management Group at Janney Montgomery Scott. Mr. Glasgow frequently serves as a speaker at defined contribution professional conferences. He received his bachelor’s degree in Finance from Auburn University and an MBA from the Crummer School of Business at Rollins College. Allan Strange, Executive Vice President/Wealth Management, leads The Strange Group at Janney Montgomery Scott. He has been advising clients on their investments for nearly 40 years. An Accredited Investment Fiduciary®, he has been a member of Janney’s premier CEO Roundtable since joining the firm in 2009 and was honored as the firm’s Financial Advisor of the Year in 2015. Mr. Strange has earned the “Top 401 Retirement Adviser” recognition from the Financial Times since the program’s inception in 2015. The FT has also recognized him as a “Top 400 Financial Advisor” from 2015 through 2017. He is consistently ranked by Barron’s as a “Top Advisor,” an honor he received in 2009, and from 2011 through 2018. In 2018, he was also recognized by Forbes as a Best-in-State Wealth Advisor in Virginia. Mr. Strange is the founder and first president of the Metropolitan Richmond Sports Backers, a past board member of Richmond Forum and the Virginia State Golf Association and is active in many local charities by assisting with fund raising efforts. An avid golfer, he played professionally for three years after graduating from East Tennessee State University.